In case you didn’t know, yesterday was the Day of the Dead. I always enjoy the celebrations for this in Bristol and the excuse to do some elaborate face painting. These two skeleton-like people are myself and partner Robin drawn from a photo taken a couple of years ago. 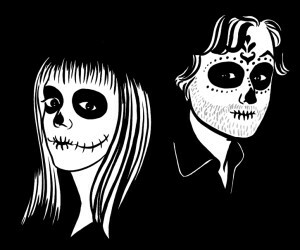 Update: for more Day of the Dead portraits please click here.